On each new episode of This Week in Google (details) Iâ€™ll highlight a tip for using cloud/Google apps smarter, faster, and better. Iâ€™ll document those tips here. This week Gmail engineers added a richer contact interface for filling in the To:, Cc:, and Bcc: fields when you’re composing a new email message. While address auto-completion has been available for some time now, the new Contact Chooser lets you check multiple recipients off a list. Click on the To:, Cc:, or Bcc: field names (which are now links) to try it out. Click to enlarge the screenshot on the right to see this in action. 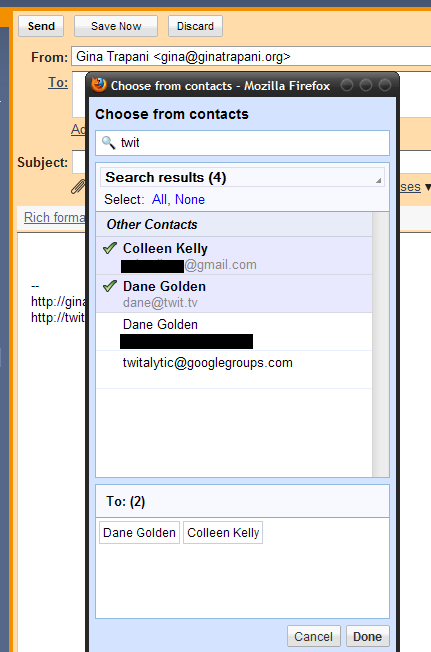 You can search for contacts by keyword, or just show names in contact groups by choosing it from the drop-down. Then, check off all your recipients from the list and click the Done button to add those recipients to your message. I still rely heavily on auto-complete as-you-type since I usually send email to one or two frequent contacts, but the chooser pop-up comes in handy when you’ve got a long list of folks to email and you need some help finding them in your contacts.